The rider was already familiar with the unparalleled durability of Rohloff’s SPEEDHUB 500/14 internal gear hub, which he’s enjoyed riding on his daily commuter for a number of years. He knew the German-made hub would provide the perfect basis for the drivetrain of his new adventure machine, and was excited to further take advantage of the hub’s benefits by pairing it with a Gates Carbon Drive belt system. 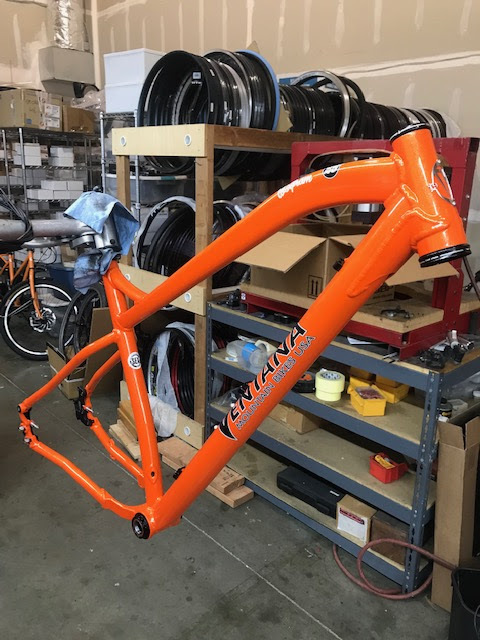 With this drivetrain as a starting point, he began searching for frames and eventually discovered a 29+ option in Ventana’s Wolfram. The platform is compatible with both Rohloff and belt drive systems with no modification necessary, and it’s one of few options available in this monster wheel size, which has become increasingly popular with bikepackers thanks to its excellent rollover capabilities and the more compliant ride that comes with higher-volume tires. 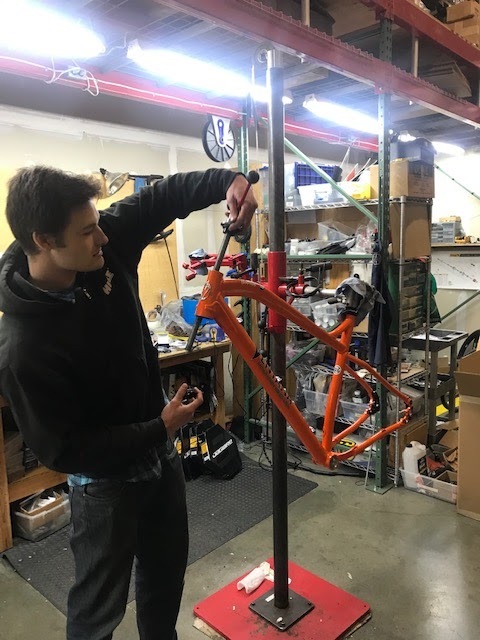 From there, he worked with Cycle Monkey to round out the build with components that would increase the bike’s comfort and utility on the longest adventures, such as a dynamo hub and lighting system cleanly integrated into the new CoLab Components Plus fork. Rohloff’s SPEEDHUB 500/14 internal gear hub has long been a favorite of bikepackers and other long-distance touring riders for both its wide gear range and consistent performance in variable conditions. 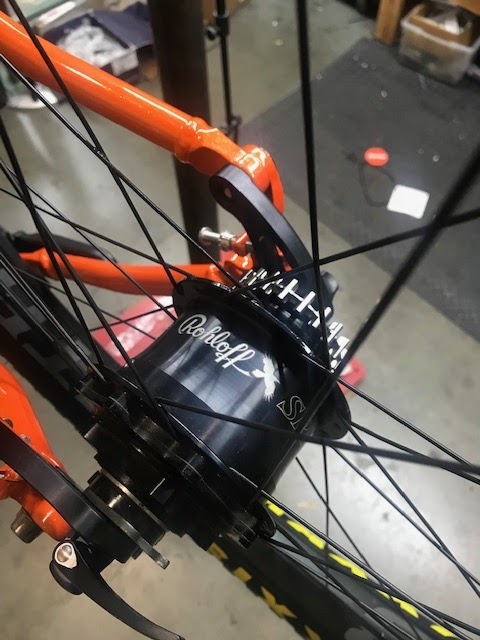 The SPEEDHUB includes 14 speeds completely encased within the hub shell, making it virtually impervious to the elements and immune to dust, dirt, muck, mud, and all things nasty. Its 526% gear range is greater than that of a 1x system with a 10-52t cassette. 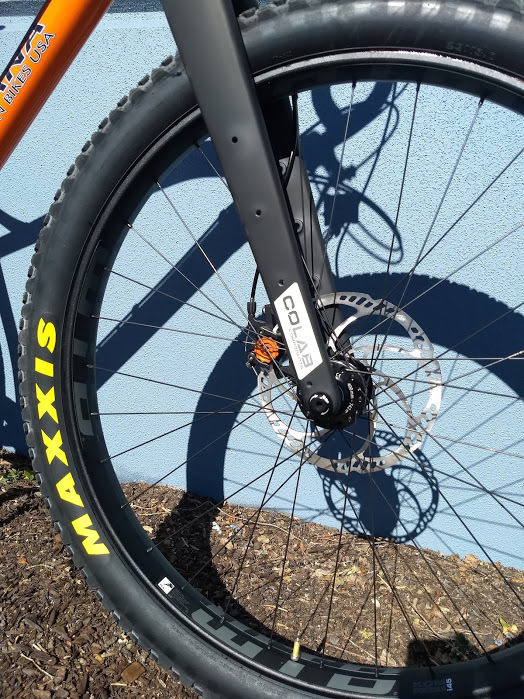 The SPEEDHUB is particularly beneficial for off-road riders because it removes the derailleur assembly entirely, offering additional ground clearance and eliminating the potential to snag drivetrain components on rocks or other debris. The hubs have a longstanding reputation for durability, and we’ve seen many riders put tens of thousands of miles on theirs with no maintenance beyond an annual oil change. Internal drivetrain systems also allow for the use of a belt drive system such as this one from Gates Carbon Drive, which are not compatible with traditional drivetrains that do not maintain a constant drive line. Carbon Drive belts require no lubrication or upkeep and last 2 - 10x as long as a chain, depending on use. They are also far more durable than chains, making them a favorite for ventures far into the sticks, where a snapped chain could result in a long walk back to camp. Because they do not split like a chain, belt drive systems require a break somewhere in bike’s the rear triangle for installation, along with a belt tensioning mechanism such as sliding dropouts or an eccentric bottom bracket. With a mind towards building low maintenance, high fun-factor off-road machines, Ventana’s Wolfram comes belt-ready with rocking dropouts that maintain belt tension an an integrated split that makes installation of this fuss-free drivetrain an absolute breeze. Ventana USA is located in Rancho Cordova, California, just up the road from Cycle Monkey’s Bay Area headquarters. After years of collaboration on custom builds, we feel lucky to know the team there well, and they are often our first recommendation when customers come looking for a new mountain bike. 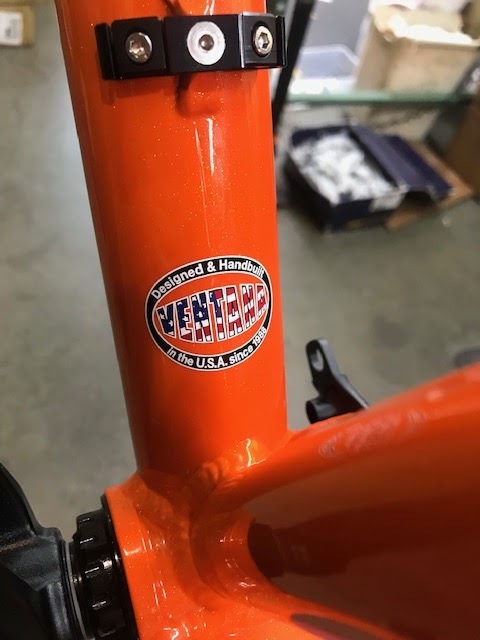 All of their bikes are designed, machined, cut, welded, treated, and powder coated in the same facility, producing a clean finish that’s too often lacking with mass-produced frames. The Wolfram model seen here is the brand’s mid-fat, plus-size tire hardtail platform, which is available with 27.5+ or 29+ wheels. More a trail bike than a cross country race machine, the bike features a balanced modern geometry that inspires confidence on rougher descents and offers stability when loaded down with camping gear and other supplies. While this customer opted for the additional versatility of a bikepacking-focused carbon fork, the Wolfram does accept suspension forks with 120mm of travel. The wider 3.0” plus-size tires seen on mid-fat bikes offer additional comfort and dampening on rough roads and allows riders to maintain a lower tire pressure even when their bikes are loaded down, thanks to their high volume. 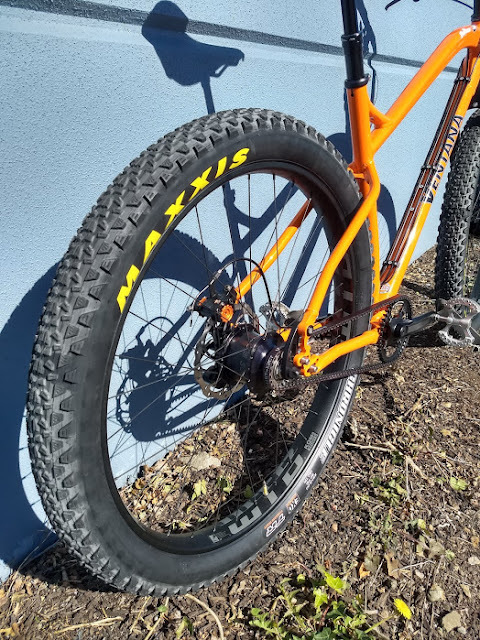 They also provide additional traction and stability compared to traditional mountain bike tires, making them an excellent option for newer riders as well. The Maxxis Chronicles seen on this bike were specifically designed for the 3.0” width, with a versatile tread pattern that’s fast-rolling but offers consistent grip at any angle. 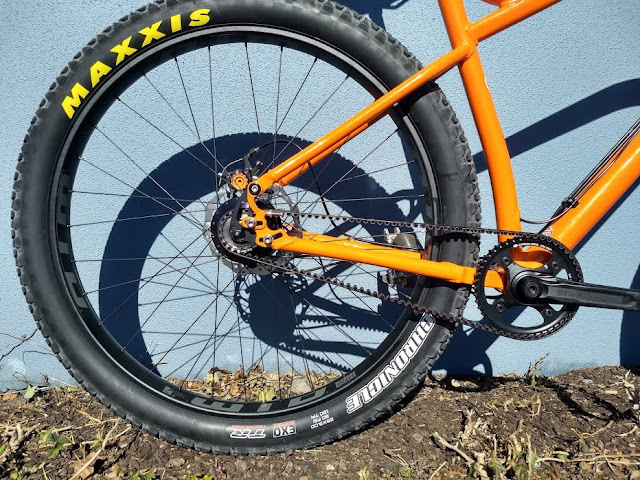 While the Wolfram is a chameleon-like platform that can be set up for a wide variety of applications, the spec on this build is fully optimized for convenience and comfort on long bikepacking trips. 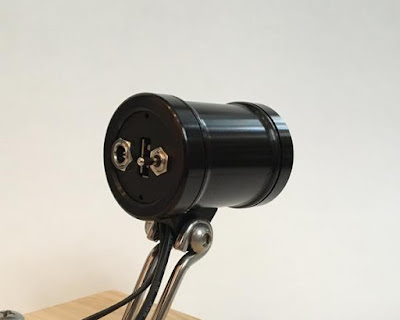 Dynamo hubs are an excellent solution for those venturing far beyond the availability of wall outlets, and for those who simply don’t want to worry about charging their lights. The Schmidt SON 28 seen here contains a small electric generator that self-powers lights and other accessories with no charger necessary. The Sinewave Cycles Beacon headlight seen on this bike is distinct from other dynamo-compatible headlights thanks to an integrated USB charging port that allows you to charge a cycling computer, cell phone, or other electronic devices from the dynamo system without the need for additional hardware. The Beacon has more light output than any other dynamo headlight, and also features a dynamic power input that’s capable of accepting power from the dynamo hub alone, an external USB battery pack, or both simultaneously. The Beacon will automatically adjust its power source based on your speed, drawing from the battery pack to maintain full illumination at lower speeds, and switching to strictly dynamo-derived power as speed increase. With no external battery pack connected, the light functions like any other dynamo headlight. Further integration is achieved with the CoLab Components Plus fork, a carbon fork designed specifically for adventure riding and bikepacking. 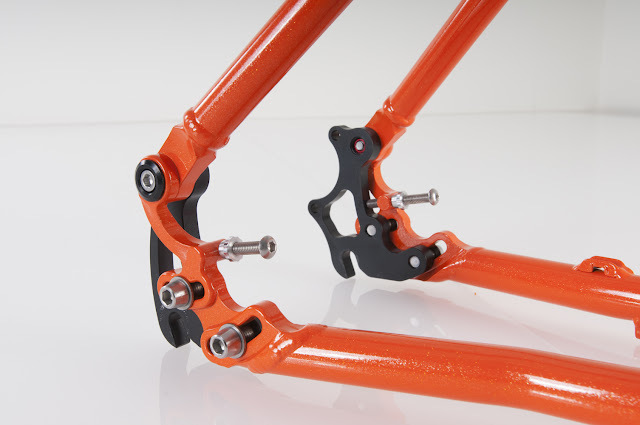 CoLab Components was started by Cycle Monkey to address a gap in the market for dynamo-ready carbon forks that could further integrate a bike’s electrical and mechanical systems. CoLab forks are available in a Cross and Plus version and both feature integrated wire routing for headlight and USB charger cables, integrated mount points for a light and fenders, 3-pack holes on the fork legs to carry extra gear, and replaceable threaded components to extend the life of the fork in the case that external hardware were to be overtightened. The forks have also tested for use on loaded touring bikes, and even tandems. 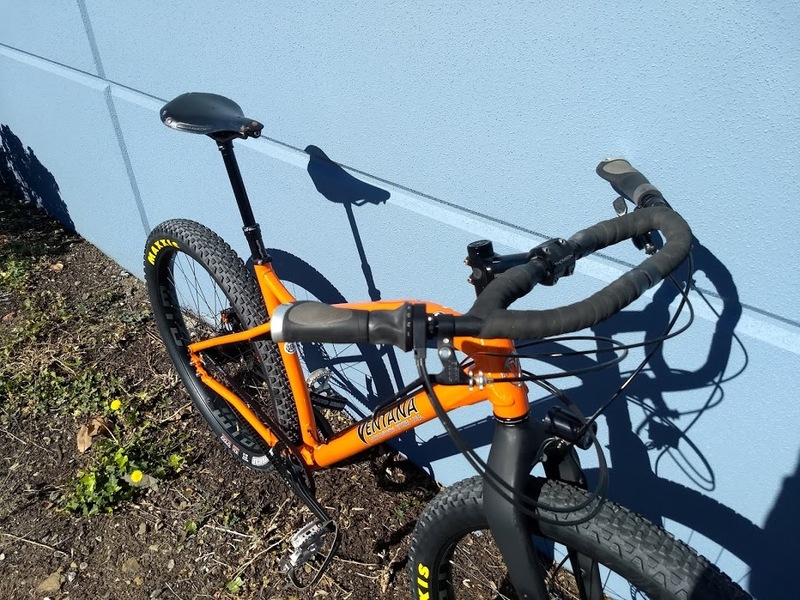 The build was finished off with ergonomic touchpoints that would increase comfort over the long haul, such as a Brooks saddle and Jones H-Bar, which allows for a huge range of hand positions compared to either a traditional flat or drop bar setup. The E13 TRS+ dropper post allows on-the-fly saddle height adjustment, and is a real game-changer for anyone riding hilly off-road terrain. We were thrilled to build up this bikepacking dream rig with a local frame and components for a local customer. If you have a custom bike build in mid or have questions about internal gearing, don’t hesitate to drop us a line. Want to see more custom bike builds and the latest products for touring, bikepacking, commuting, and more? Give us a follow on Facebook and Instagram.